"Everyone who is alive has a ghost inside them, don't they?" 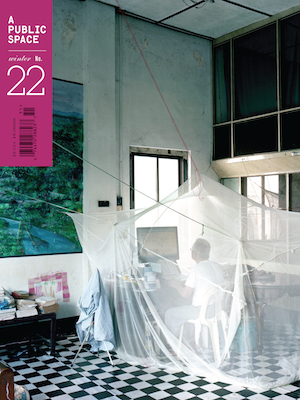 –Kelly Link's ​N​ew Boyfriend; ​Jamel Brinkley's Lucky Man; ​​fiction from Kathmandu by Prawin Adhikari; John Haskell remembers George Trow; Julia Cooke ​participates in​ the Parable Conference; ​​new fiction by​ ​Garth Greenwell​ and Anna Noyes​; poems by Maria d'Arezzo, Caroline Knox, Kevin Prufer, and others; and introducing Andrea Maturana. While Villagrán waited on the other side of the curtain for her to get undressed, he began to hope that there was something truly unusual wrong. With any two people one would get the brunt of it, and time had hit him worse than any beating he'd ever seen in the ring. Their power is rooted not in their beauty but in the sense of inclusion they offer, a sense of inclusion that, for some people, isn’t as important as truth. It would not surprise me to find I am dead— / as my soul is full of sweet things / I never found in life. Before we knew / what pleasure meant / we were multiplying, / going forth / into surrounding space / until all space / was pain. Their job is to write the placecards, so at the head of the table / they are putting Gilbert Osmond, and honorably on his right / they seat Margot Macomber. A sounding at the ear. And a ringing at the doorstep. Look, she said, a sounding at my hair, and a laughing in the footsteps. Ripped from the earth like weeds / we clutch at our names, / we do not know how / this loneliness has found us. Perhaps the songs they sang for us / were not those we’d have wanted to hear, / but who among us can, with a clean conscience, / say of himself that what matters to him / is what others listen to. An empty all-white room with drapeless windows / as winter spills its math across the sills / where nothing suffers, that’s where / there’s nothing left to misremember / or forget. Rigor is no longer involved. Peeling back / reveals two discrete compartments, adjoining. I am not gigantic and I don’t keep my head down—like / the now-extinct elephant bird. Because we were young / our picnic / Was hard-boiled eggs & black coffee in a flask. The half-plastered ladies in tennis whites / at the taped-off perimeter / whispered among themselves, how sad. To feel fully seen, period, is powerful; to feel seen by another person in something that calls itself a work of art is ever more so. I remembered the certainty I had had, hours before, of my own competence, the pleasure I had taken in the solace I could give. When someone much weaker than you confronts a brute much stronger than you and fights to the death in defense of an ideal, something gives inside: you become a bit of a coward.